If you’ve poked around the online shop, you’ll notice it’s a wee bit empty. Currently, I have a bunch of pieces in shows and some have very recently been delivered to Whitman Works. This gallery is located at 1826 Penfield Road (at the Four Corners intersection at Five Mile Road). 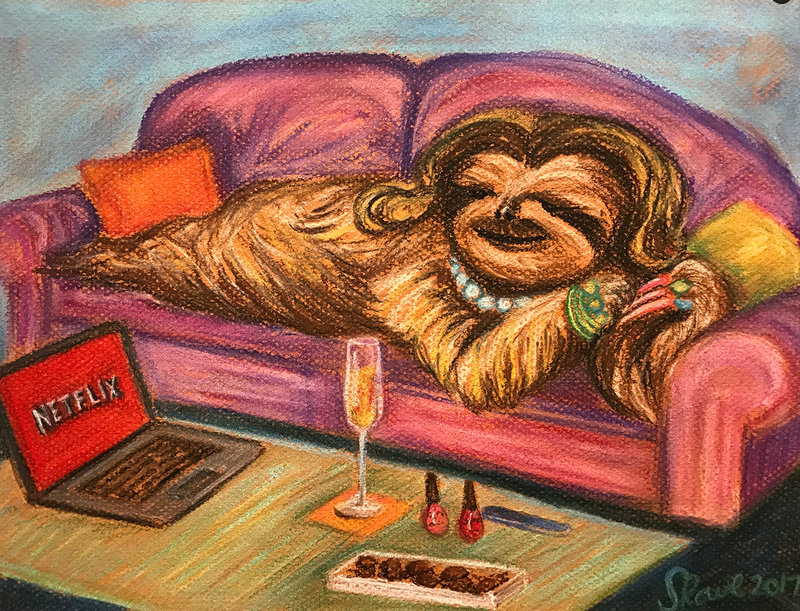 Below are the paintings that are currently there, along with a framed and matted drawing, “Lady of Leisure” (a.k.a. Sheila the Sloth), above. Whitman Works has a mission to connect people with local artists and artisans; and to build a community of creatives and patrons. In addition to having work for sale, they also host rotating shows. Stop by while they are open Wednesday through Saturday. They can be contacted for pricing and info here.